I love making cakes for people I know and care about. It makes it more fun, knowing the bride/groom, or birthday boy/girl that is going to get it while I’m up all night working on it. So when one of my dearest friends. Jesseca from One Sweet Appetite, asked me to make another cake for her I was THRILLED! 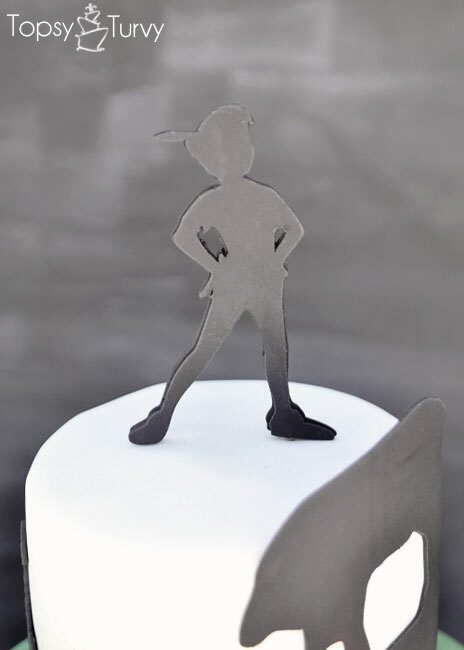 a Peter Pan party with scenes from the movie cut out of black fondant to look like shadows! I’m in LOVE with how it turned out. Here is my mock up that I sent to Jesseca for approval before starting. 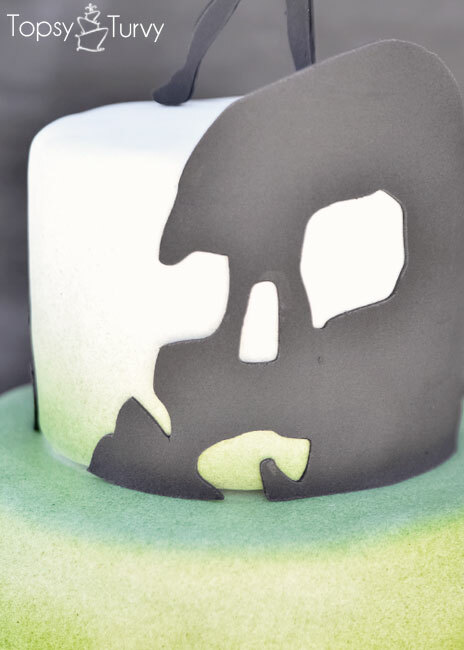 These example tiers are the WRAPS (so the 4 inch tier is represented with 12.5″ wrap) so you can see the front and back as this cake spun so you could see the details on every side! 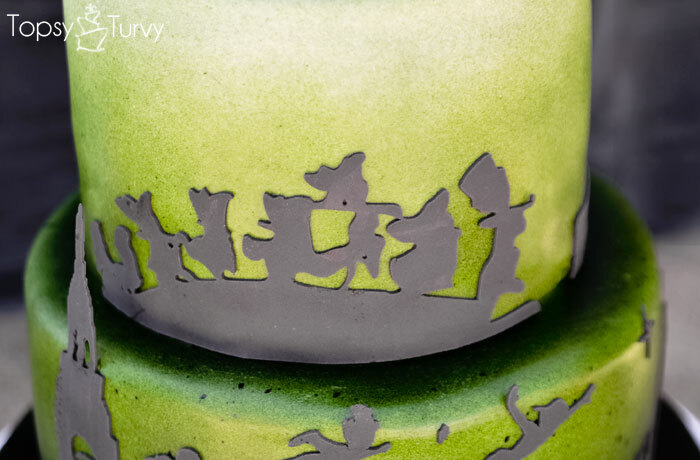 here is the back you so can see, it’s simpler than the front, but still has some really fun details that complete the “story” on the cake. 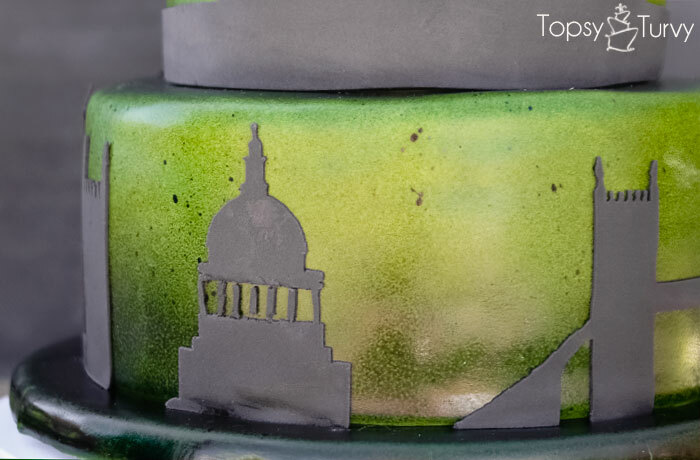 The bottom tier is the beginning of our “story” with the iconic flying over London images. 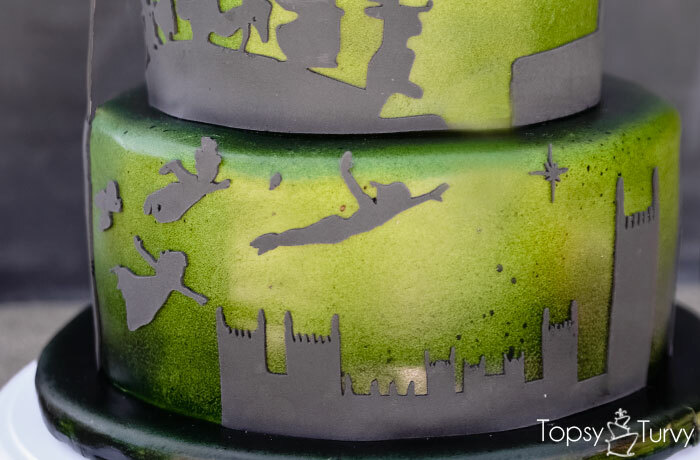 Starting with Big Ben (I wanted a 3d effect to the layers so often the details of the cake extend past the tier) with Wendy, John and Michael following Peter and Tink! 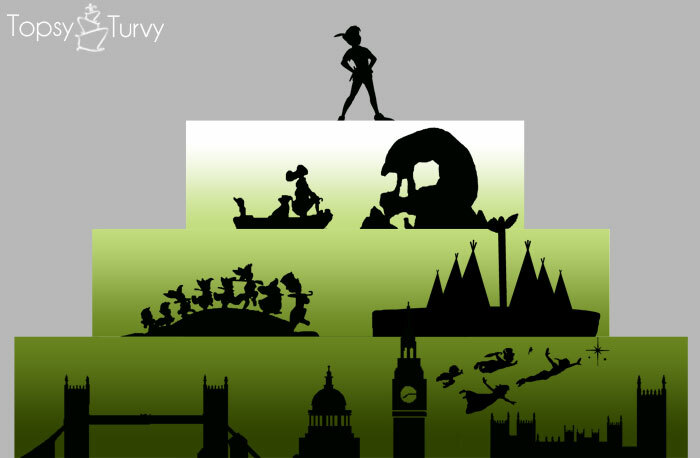 Here you can see Peter Pan and Tinkerbell (she was so small some of the details got lost) following the Neverland Star. 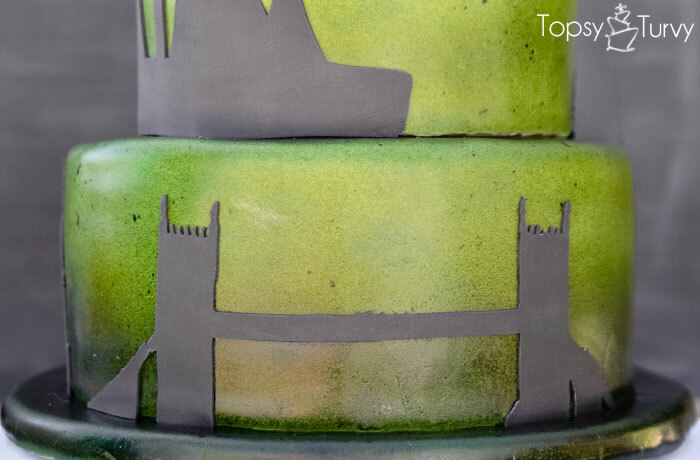 And around the rest of the cake more iconic buildings we see. There are of course more rooftops and business in the movie, but I wanted to keep the cake simple, so it didn’t look too messy. And ending with London Bridge, coming back around to Big Ben! The second tier starts with John, the Lost Boys and Michael bringing up the rear. Singing “following the leader” of course, can you look at this WITHOUT singing? I dare you! on their Way to the Indian Encampment! This was actually the hardest silhouette to create. There are barely any images on this full encampment, and the ONE good one I could find had so many tepees it was hard to tell one from another so I simplified it before cutting it out. 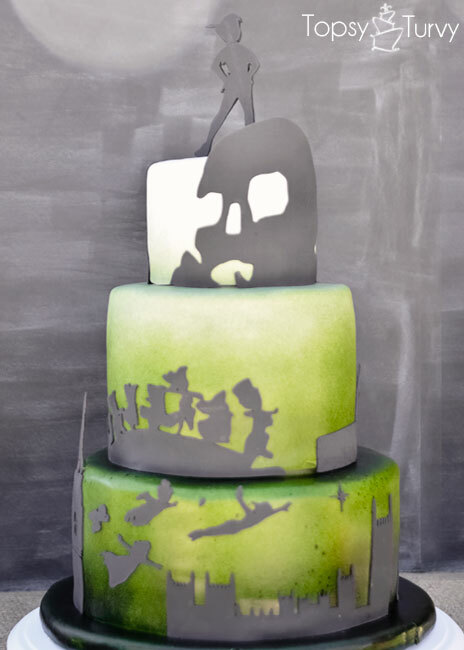 The Birthday Boy loves skull island so it took the front spot on this tier, I enlarged the skull to stand over the height of the tier and I love how it turned out! And finally Peter tops us off. So many of these images had his arms crossed, so I was thrilled to find one with his arms on his hips so you could see more of his shape! There you have it! 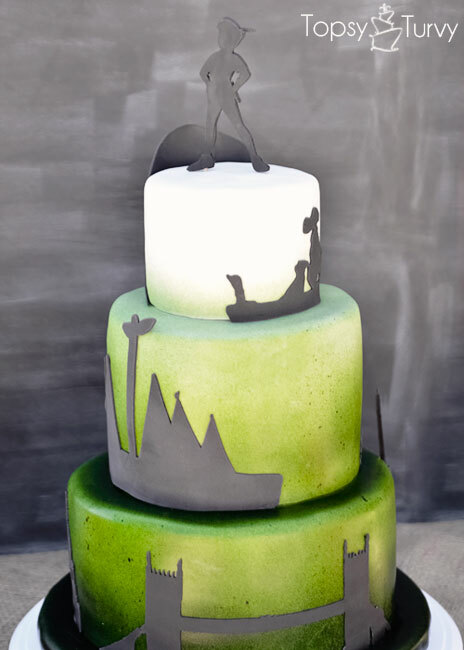 If you were going to do a movie cake with scenes like this what movie would you pick and what would your favorite scenes be? Or if you were doing Peter Pan what scenes would you have picked out? Thanks so much! I’m really happy with how it turned out! very few cakes turn out as GOOD as they are in my head. 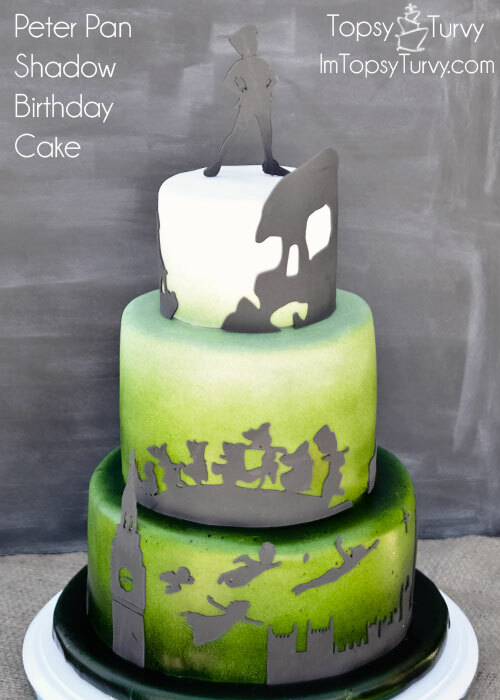 wow, this cake is amazing! I am totally impressed! Thank you so much! I’m tickled with how it turned out! I love it when a cake comes together! This cake is incredible, Ashlee! You need to be on a food network cake battle. You are so creative! man wouldn’t that be SO much fun??? I would totally love that! 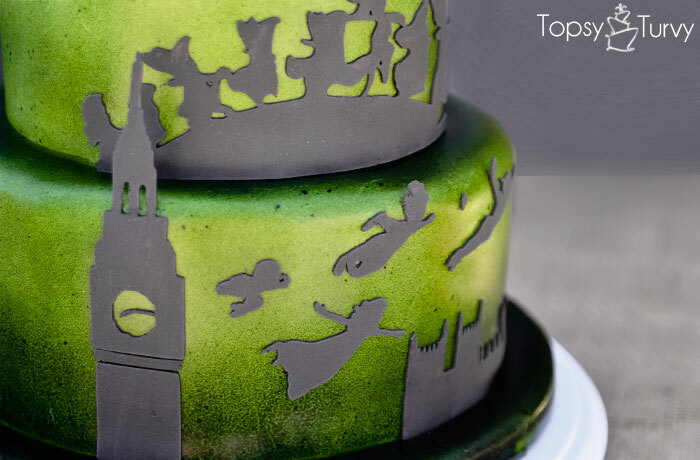 Oh Ashlee I love this cake – Your work is always so awesome. I just love the silouette of all of the different pieces. thanks so much! it was so much fun coming up with what scenes we thought would work best, and represent the movie! 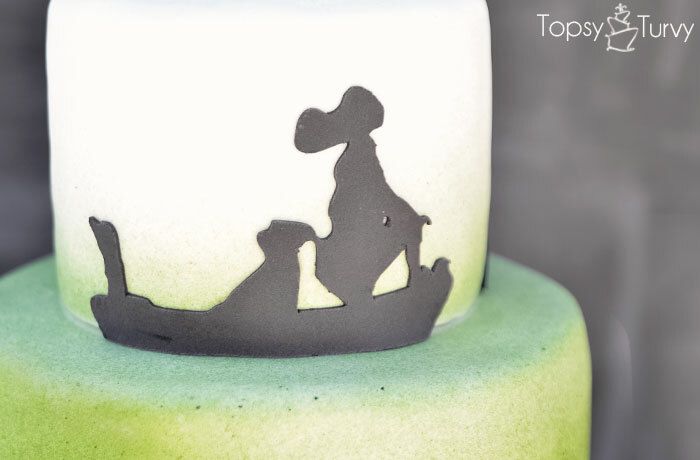 oohhh that could be a really fun cake with this silhouette/shadow look! 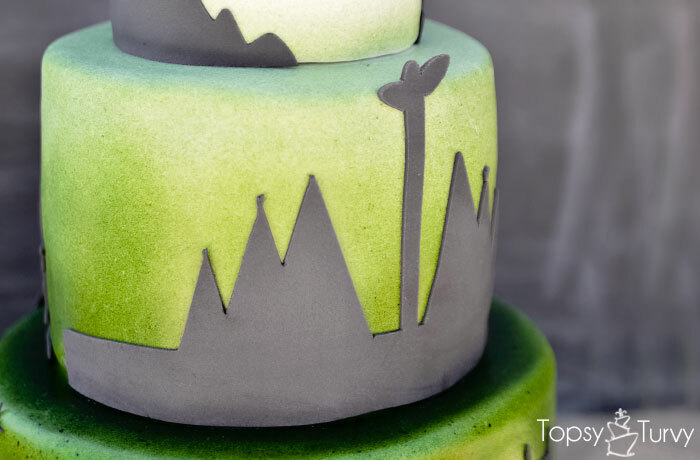 I just started blogging – Love your blog and this cake! I MUST share it on FB. Amazing job! Thank you so much! Feel free to tag me on FB and share a link to your favorites! This was a really fun cake to make!